Geoengineering–deliberate manipulation of the Earth’s climate–has gained traction in recent years as a supplement to more traditional climate change reduction schemes. The concepts advanced in the movement range from the practical to the wacky: forests of synthetic trees, microbubbles pumped into the ocean, algae-lined buildings, and ships that spray climate-altering clouds into the sky. But while these schemes largely remain pipe dreams, one inventor has already begun a geoengineering project to restore a Peruvian glacier by painting a mountain white. 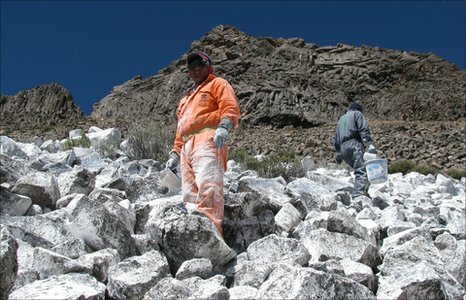 It sounds too good to be true, but Eduardo Gold believes that he can restore an extinct glacier in the Peruvian Andes simply by whitewashing a mountain peak. Gold has already begun brushing the Chalon Sombrero peak, once covered in snow, with a solution made from water, lime, and industrial egg white. So far, workers have covered nearly 5 acres with whitewash. Ultimately, Gold hopes to cover three peaks and 173 acres. Gold’s project has enough scientific merit to get which was awarded $200,000 by the World Bank as part of its “100 Ideas to Save the Planet” competition. By changing the peak’s albedo (the strength of the surface’s reflection of light), the inventor believes he can cool the mountain’s surface, triggering a cold micro-climate in the surrounding region. The same principles apply to U.S. Energy Secretary Steven Chu’s plan to paint rooftops white to curb climate change.